1. Forward starts at blue line, builds speed, picks up puck at far blue line and carries it into the zone with speed along the wing. Can also start at far end if using the whole deck. 2. Defense read the play to stop the puck carrier. 3. 1st defender (player closest to F) moves out to take on the forward. 4. 2nd defender (Read D) reads the play and reacts to F’s move. 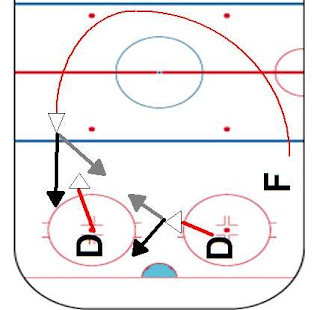 If inside, challenge and steal, if outside, move to front of net to support. -Forward must enter the Zone with speed. -1st defender job is to force F right or left. -2nd defender needs to read play, if left, challenge to stop, if right, provide support and not allow shot. 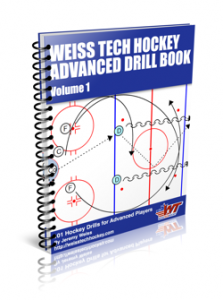 Thanks to Nino Febbraro for submitting this drill.